Your floor makes an impression from the home moment you walk in the door and often sets the tone for the entire space. Here's how to make a statement they won't forget. Knowing what you have to spend ahead of time will make it easier to make the right selection. There's nothing like all-natural, high-end stone, porcelain or hardwood to make a dramatic statement. But even at middle price points, there are lots of options - including laminate and luxury vinyl - that offer compelling, realistic visuals along with outstanding performance. Don't overlook carpet which does a great job of trapping dirt and wetness but will require more frequent cleaning. Avoid the low end of the market altogether (unless you absolutely must); chances are you won't be satisfied over the longer term. However, there is an argument to be made for choosing cheaper products and replacing them more frequently, especially in special settings (see below) like beach homes or homes where snow and ice are a consideration. This is where you choices are going to have the biggest impact. Choose a floor that is not up to the task and you won't be happy no matter how great it looks. 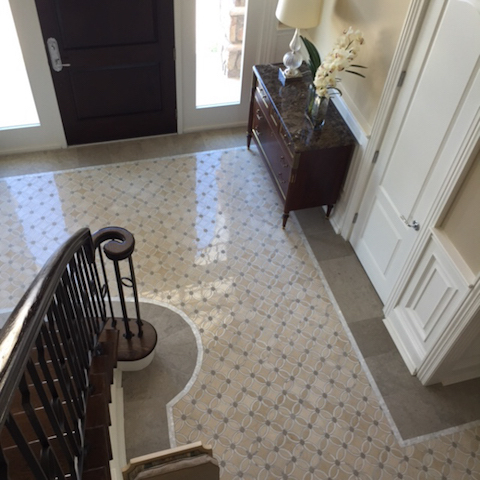 Ceramic/porcelain tile and stone are extremely durable. Hardwood, too, can wear exceptionally well in the right setting but does not stand up to heavy traffic very well and is reactive to water. Laminate and luxury vinyl offer outstanding performance, although laminate is also susceptible to moisture issues. Carpet stands up to wear but excessive moisture can leave it damp and musty; it also offers the added benefit of hiding soil tracked in from outside. Creating your own style is easy as flooring offers looks from formal to casual in a variety of options. Even at middle price points for hard surface flooring, you can have the look of high-end natural tile, stone and hardwood at a fraction of the cost. One of the best things about carpet is in the use of color and pattern it offers. 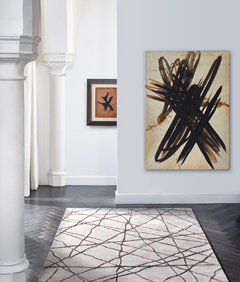 Area rugs are a natural for hard surface floors for reasons from design aesthetics to functionality. Rugs also allow you to easily and affordably change the mood and feel of any room - as often as you like! But there's another important benefit: Like carpet, rugs are great at trapping and hiding tracked-in soil and other nasties that can damage your floors. Sand and surf pose special challenges to any floor. Sand is highly abrasive and will compromise the wear layer over time. The best choice is porcelain tile which has the highest abrasion resistance of any floor. Ceramic tile, which is "softer" than porcelain, will not wear as well. Stone is a good choice but be careful, softer stones will show wear rather quickly. Believe it or not, carpet is a good choice for these settings because it is relatively inexpensive and can easily be replaced, it hides dirt and sand, can handle moisture issues and offers a wide range of style options. If inclement weather - snow, slush, ice (and road sand and salt) - is an issue where you live, you probably want to avoid hardwood and carpet. Ceramic tile is a great choice but make sure you get the slip resistance you'll need for these often wet and slippery conditions. Laminate can work but opt for moisture resistance if that's your choice. Luxury vinyl is one of the best choices for these spaces, not only because of outstanding performance and water proof features, but also realistic visuals. Definitely use walk off mats and you may consider a carpet runner to make sure that nasty weather is not tracked into the house.